The Whirlpool Duet System has been a hit since its’ inception. The new WFW9500TC is simply going to add to the legacy. The TC at the end of the model refers to the color, which is Tuscan Chestnut and a very rich looking color and style. 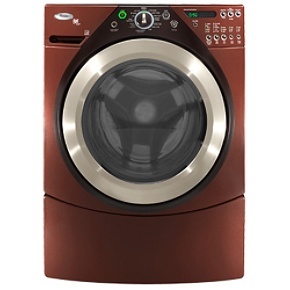 It is a full 27-inch sized front load steam washer giving ten wash cycles and four temperature options in a full four cubic foot capacity. It is CEE III rated on energy star and spins out a phenomenal one thousand RPM speed. The new steam model introduces a new way to handle laundry, which virtually removes the need to do any type of pre-treating. Even grease, grass and other tough stains come out with the magic of steam. And as a side note here, that same steam will give you sanitized clothing, which is like 99.9 percent free of germs. So not only is it getting your clothes clean, it may help keep you healthy as well. One of the pros about this unit and on most front loaders is that you get a large capacity and ease of use in a format that is accessible to women. What I mean by that is that it is easier to reach all the way into a front load washer. Where the top loaders, especially with smaller women, are difficult at best to reach the bottom of the tubs basket. Another huge plus for a front loader like this is that you can actually wash a larger load with less water so it is good for the energy bill and the environment. That means you are being kind to your wallet and the earth, which is always a good thing. You can also get a storage pedestal for the units which will allow you to store things like detergent and such below your unit so they are always within easy reach when you need then and not stored away in the back of a cabinet where you might need a step stool or small ladder to reach them. Front load units also are more fun. Let’s face it. Doing laundry is a chore and one that tends to take a good portion of time. It’s a nice little plus if it can add just a little bit of fun into the routine. On the negative side of the coin are things like the physical size of the unit. They are taller and as such may require the redesign of your current laundry area, particularly if it has been set up with shelves above a conventional set of washers and dryers. This means that on top of the expense of the unit, you might have to have a carpenter of contractor come and re-design the area. Another feature detrimental to these units is the actual purchase cost. These units tend to be more feature rich and in demand and so they command a higher retail sales price than you will find even on a top of the line model in a top loader.